Using high frequency electrical stimulation is a non-invasive and effective way to address many popular skin concerns making these treatments a favourite among skincare professionals. 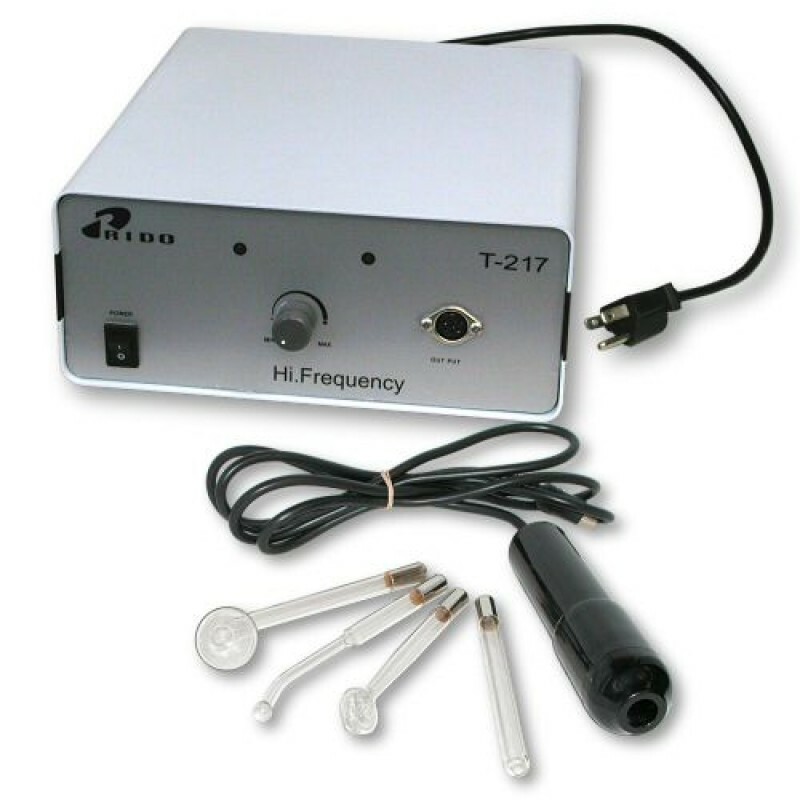 Make the smart decision, and buy spa equipment such as this High Frequency Unit T-217 from Natali Products today. Offer your clients one of the best skincare innovations in the industry. The high frequency device is simple to operate, and it’s gentle on skin. Plus it’s so versatile, you can use it on the face or even larger areas of the body. The High Frequency Unit T-217 generates high voltage of 10-100 kV with a frequency of approximately 400 kHz. And since the current of the generator is very low (10-15 mA), the unit is safe to use. The unit can also come in either a 110V or 220V depending on your needs. The voltage applied to the glass electrode is filled with Argon (Blue/Violet) or Neon (Pink/Orange) gas. Free electrons inside the gas start to move at a high speed, which produces an electric current in the gas. It also comes with a mushroom electrode (Blue), and other 3 electrodes (Pink/Orange). A major advantage of this spa equipment device is that you have a wide area open for customization. This allows you to treat your clients on a case-by-case basis. The front panel of this machine includes an intensity regular that allows you to increase or decrease the strength of the output. If your client has dry skin, apply the electrode directly over the treatment cream or mask. The high frequency current will have a sedative effect. Oily or impure skin? Use the pointed electrode to spark the blemish. This will increase healing process. Purchase the High-Frequency Unit T-217 from Natali Products today, and also check out the other spa equipment for sale. Note: Spare parts for this unit are available. To view or purchase them, click here!